Home > BlackRock > Are Retirees Worrying Too Much about Medical Expenses? Are Retirees Worrying Too Much about Medical Expenses? Up there with outliving one’s retirement assets, concern over health care expenses in retirement weigh heavily on most retirees. Supporting these fears—and perhaps fanning them—have been several reports in recent years couching total health care spend in absolute dollar terms. Fidelity made waves in 2002 with a study that showed a retired couple, both age 65, spends about $160,000 on medical expenses in retirement. In 2017 Fidelity upped that number to $275,000. Just last month, RBC published a survey that says an average couple entering retirement at age 65 faces over $400,000 in future costs of care. In all of these studies, the top numbers attempt to capture total in-retirement spend based on longevity and other forward looking projections. These dollar amounts alone can cause a pre-existing condition. Take a deep breath and look beneath the surface: it’s important to separate those health care expenses that can be planned and budgeted for, such as premiums, from less planned, out-of-pocket expenses. For many, it is the unexpected, out-of-pocket expenses that cause the most anxiety—particularly the fear of being financially wiped out by catastrophic end-of-life medical costs. 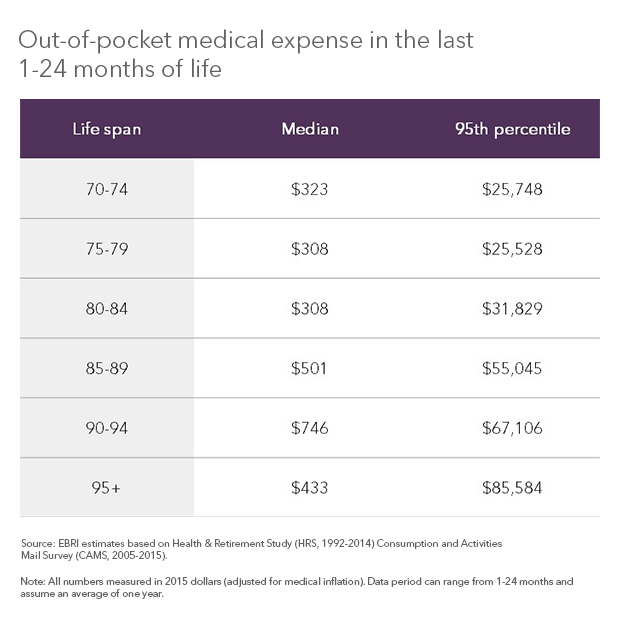 As part of BlackRock Retirement Institute’s (BRI’s) retirement spending research, Spending in Retirement…or not?, we looked at the impact of out-of-pocket medical expenses in order to shed light on why people in our study might have been husbanding retirement assets. For them, were unexpected health costs an issue for not dipping into their retirement savings? We measured median out-of-pocket expenses just prior to retirement through 17/18 years into retirement. We also segmented retirees into three groups based on pre-retirement non-housing retirement assets—$0 to less than $200,000 (low wealth), $200,000 to less than $500,000 (medium wealth) and $500,000 and above (high wealth). What we found was that across all three wealth groups, most retiree households experienced fairly consistent and reasonable out-of-pocket annual expenses from a low of just under $1,500 annually for the low wealth group and just over $2,500 for the medium and high wealth groups. See the accompanying chart. This is lower but not entirely out of line with Fidelity’s estimate that the average 65-year-old retiree today should expect to pay around $5,000 a year on out-of-pocket annual expenses and premiums. We also looked at one of the greatest financial fears for people in retirement—the cost of long-term care associated with a major medical procedure, sharply declining health or treatment for cognitive disorders—particularly in the last year or two of life. 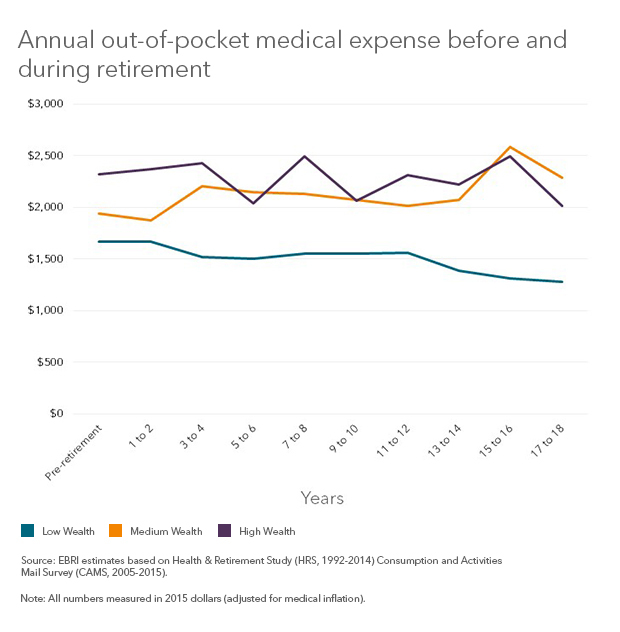 Our research suggests however, that out-of-pocket medical expenses were quite low for the vast majority of retirees during this period and only start to escalate for a small portion of retirees. See the chart below. While our retirement health care spending research looks back over the last two decades unlike the forward looking industry research noted above, we think it says a lot about actual health care costs and spending behaviors of current retirees. And to answer the question posed by the title of this post—we don’t yet see out-of-pocket health care costs as warranting top concern. Moving forward, retirees will face several headwinds, rising health care costs being an important one, but the good news is that with improved savings behavior, steady and consistent planning and investing, and sound guidance on retirement income, future retirees can better enjoy the assets that they spent an earlier chapter in their lives building.